This week’s Poison of the Week is called Bud Nip. Elise is a young student who ran an interesting test on this chemical. Hope you enjoy it. With the help of her grandma, Elise buys a sweet potato from three different sources: one from the grocery store, one “organically” labeled from the same grocery store, and one from Roots, a certified organic food market. Each sweet potato is placed in a glass of water in order to track its cultivation of vine sprouts and growth. The first sweet potato, the one from the grocery store, does not sprout any vines after three weeks. The second one sprouts a “wimpy, little vine” after over a month. The third sweet potato, the one bought from Roots, flourishes with cascading, healthy green sweet potato vines after just one week. 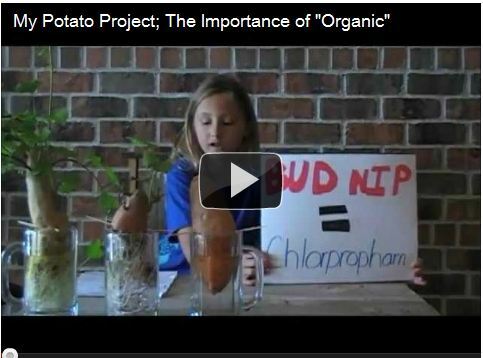 What seems like an innocent fourth-grade science project is actually an informative and effective account of the effects of a commonly used chemical herbicide called “bud nip.” The produce man at the grocery store informs Elise that the first potato won’t sprout any sweet potato vines because it has been sprayed with bud nip. According to the Pesticide Action Network, the dangers of bud nip include toxicity to amphibians and honeybees, important pollinators of crops we eat every day. Bud nip can be found on potatoes, kale, peaches, broccoli and other common fruits and vegetables. Find out what other foods have chlorpropham here.